Many of our founding fathers held strong personal beliefs in the LORD God. Many of the men and women who colonized America did so in an effort to find a safe new place to worship God as their consciences dictated, without hindrance from any established government religion. They found what they were looking for here. When it came time for America to establish its independence from England, the Declaration of Independence was written. In it are some very strong words tying the rights of human beings to the existence of their Creator. We hold these truths to be self-evident, that all men are created equal, that they are endowed by their Creator with certain unalienable Rights that among these are Life, Liberty and the pursuit of Happiness. These words, and the words that accompany them, are some of the most amazing words ever written! They state that, just because God has created people, we have a set of certain rights, which belong to every person. Essentially it says that we have these rights just because God created us and gives them to us! The Bible says that “Blessed is the nation whose God is the LORD” as we read in Psalm 33:12. It referred originally to the nation Israel, but can refer to any nation whose God is the LORD. Our nation has been blessed by following the LORD God. God blesses our nation directly and indirectly. He blesses us directly because our country was founded by men and women who followed Him, and there are still many people here who worship Him and follow Him. He blesses us indirectly because the laws of our country were set up to reflect God’s Law which is given to us in the Bible. Following God’s laws, and His will for us, brings blessings. Yes, our country is blessed. But the Bible speaks of another blessing as well. 4000 years ago God told His servant, Abraham, that “All nations will be blessed through you.” This promise was fulfilled 2000 years later when the Messiah, Jesus Christ, the Son of God, was born! Jesus was a descendant of Abraham, and it is true that through Jesus all nations were blessed. Through Jesus anyone anywhere in the world may be set free of sin and death, because He paid the price for all our sins. John 8:36 tell us: So if the Son sets you free, you will be free indeed. People from every nation all over the world have accepted Jesus as their Savior! God has truly blessed the whole world through His Son, Jesus Christ, and through Abraham, His ancestor. 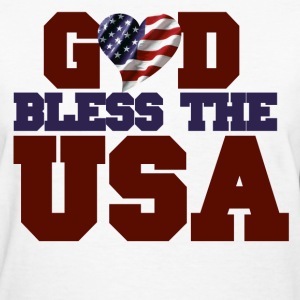 And God has truly blessed our country as well! God bless America! Dear Lord, we thank You for blessing America. Help us turn our hearts back to You. Help us to remember to pray for our leaders as they lead and make decisions. In the Name of Jesus, Amen.